While only a small number of these men took home an award on September 17th, many looked like winners in some very stunning tuxedos! This nominee might not have won in his category for Outstanding Lead Actor, but I think Ansari won for the sleekest tuxedo. Every detail of this suit is formal and polished, from the arc shawl satin lapel to the sleek ticket pocket. The fit is perfect for him, minus a few small bumps (like those wide shoulders), but Aziz pulled it off with minimal accessories and a slimmer cut. 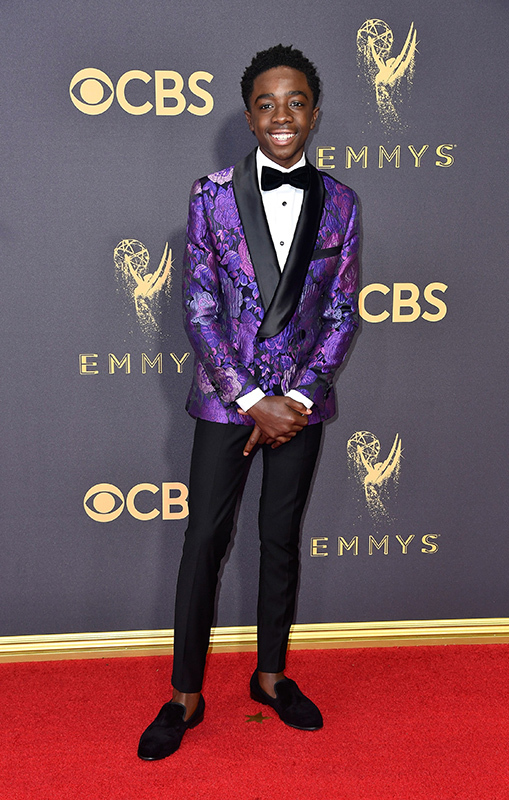 Second best tux of the evening goes to the young Stranger Things actor. McLaughlin proves that anyone can have style, regardless of age. The purple floral pattern of the jacket paired with sleek black satin, on top of a low-positioned first button, and double-breasted to boot? This kid has sartorial style in the books. Not only does he dress well, but you can see how good he feels in that tux jacket. Sullivan’s ensemble might be too far out there for some, but I can’t get over the Wellington top hat and the cane (I’m a sucker for Victorian-era fashion, so of course, I’m in love with this). The jacket itself is a darker navy, kept classy with the purple patterned bow tie and pocket square. 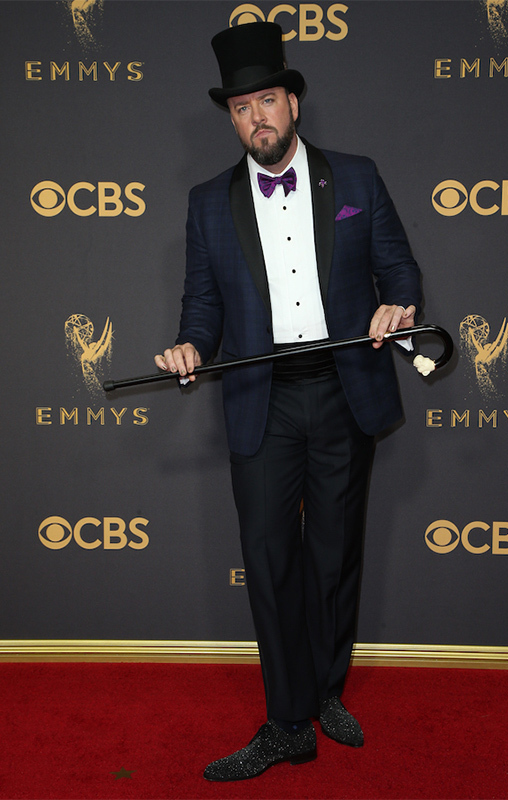 The This Is Us actor didn’t stop the flair at the accessories, but upped it for his choice in dress shoe. I have no idea what brand or material those are, but in my opinion, they make this look. Chris shows a powerful example of flashy style in a very reserved, tasteful way, and I honestly wouldn’t expect any less from this gentleman. The talk show host put a small twist on a formal tuxedo and opted for a navy birdseye jacket, which is something I honestly wish more men would do. The subtle pattern creates variety, but is by no means too loud. 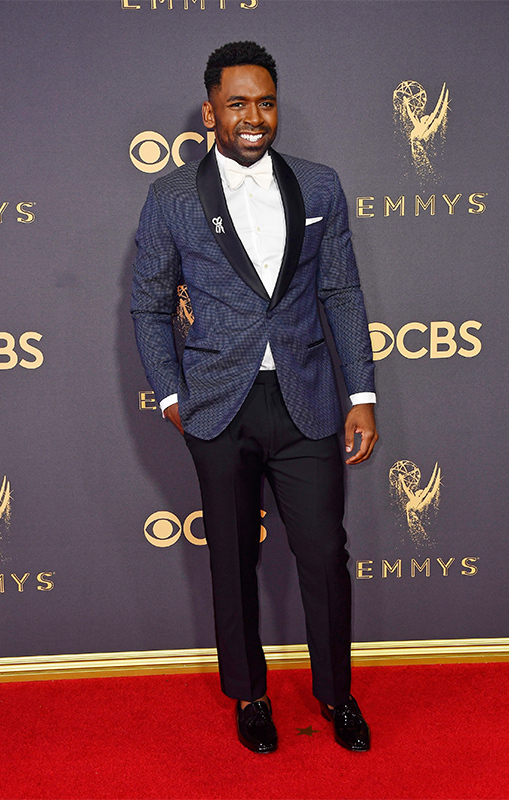 The satin accents on his pockets and full shawl lapel are sleek, and he chose to accessorize with white details, breaking up the black and navy. The fit of this separate two-piece tux is amazing on Sylvester, and is easily one of the best looks of the night. This very well-known actor almost did not make the cut this month, but the saving factor was the print on the jacket. Similar to what Justin Sylvester wore, the tux has a charcoal diamond pattern, and earns Bomer a spot on this list. I wish the fit were better on him, but the fabric of the jacket and the minimal details crate a classic look, which is much needed against a lot of the flashy suits that were seen that night. Simple and refined can always look just as well thought out as an over-accessorized, vibrant suit can, and Bomer proves here that sticking to the classics works well for most men. 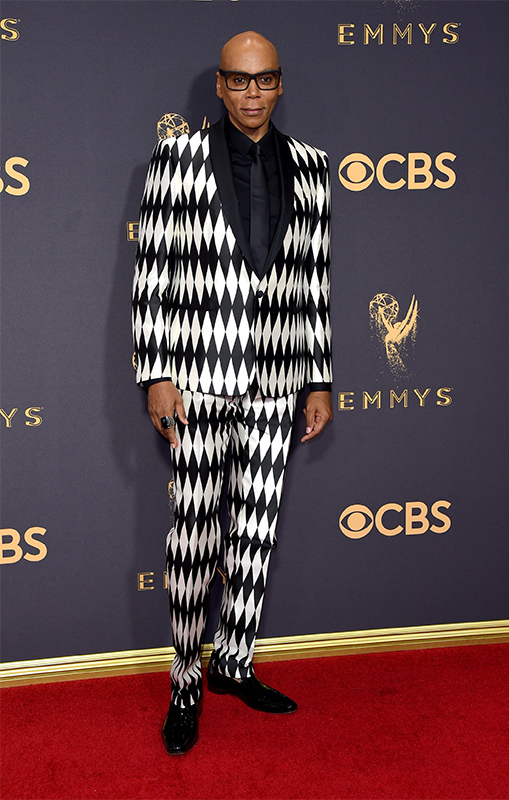 The opposite of Matt Bomer, the always fabulous RuPaul donned a printed two-piece tux with no suit accessories, with black shirt and tie. I absolutely cannot get over the fit of this on the drag queen, and it seems like this look was designed just for him. This is definitely not the loudest outfit we’ve seen him in, but this is a perfect example of a bold print worn in a very tasteful manner. It is sleek and refined, but still makes a statement.